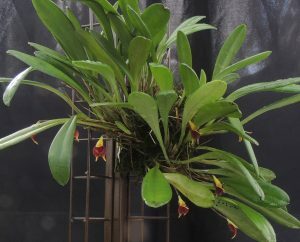 This is a small sized Masdevallia native to Peru that grows in cool forest around 2300m altitude where it grows as an epiphyte of lithophyte. It has thick rounded leaves and the flowers are produced in profusion on stems much shorter than the leaves. 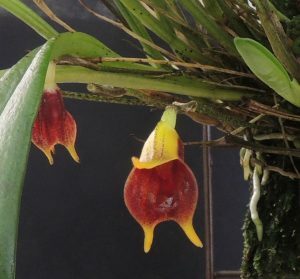 The colouring is similar to Masdevallia oreas and several other masdevallia species but each has their own character and we are very fond of pyxis because of its vigorous growth habit and cute little flowers. We find that growing the species mounted or in a small basket shows of the flowers to their best but it grows very well in a small pot. We find that it works well to stand the pot on something that allows you to see under the leaves. We grow the species in our Cool Americas section.